Thanksgiving is upon us. It’s a time of year filled with family, friends, toasty fires, and of course, copious amounts of incredible food! In 2012, my first year of strict paleo, Thanksgiving dinner, unfortunately, didn’t manifest in the smoothest of ways. It had been three months since the outbreak on my hands began. I was endlessly searching for answers as to what in the world was wrong with my hands. The symptoms, at that time, were next to unbearable. 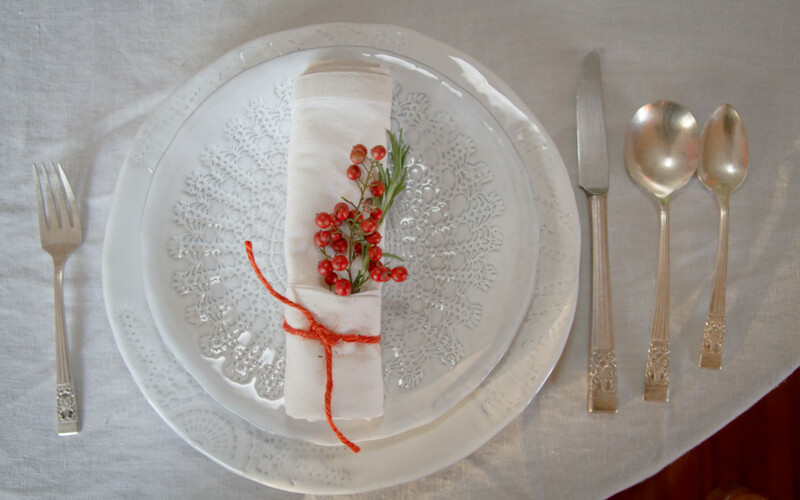 I knew that my choices that holiday season were either to eat some turkey and steamed vegetables while everyone savored the flavor explosion or find options that would quench my desire to have a classic Thanksgiving meal. Thus, I spent hours searching the web to find Thanksgiving dishes that would taste like the ones I had loved all my life, yet would fit into my paleo lifestyle. I found some great ones and created a few of my own. These recipes have saved Thanksgiving from being a depressing holiday to an exceptionally savory one. That first year I had some cooking failures, but after some tears (and a little feeling sorry for myself) everything turned out just fine. Thanksgiving has consequently been re-created into a holiday with a little more work, yet with great reward! The food is amazing! It’s every bit as good as what I used to eat, actually even more delicious! I definitely feel better afterward. No more hormone induced sleepiness. Over the past few years, I have continued to cook an entire paleo Thanksgiving meal for myself. I eat it side by side with all the non-paleo foods and have loved every bite. I want to share this Classic Thanksgiving Recipe Menu Made The Paleo Way with you so you too can indulge this holiday season and not veer away from the foods that nourish your body, only to suffer unpleasant consequences. You can eat like a king or queen and still eat paleo! I do it every day and most definitely, I do it during the holidays. Join up with other paleo eaters to share in the cooking or enjoy your very own happy, healthy, paleo Thanksgiving while everyone else eats the typical traditional toxins. Just because they’re doing it doesn’t mean you have to as well! Obviously, the turkey is paleo. You just want to be sure your preparation methods are too! Buy a free-range, organic turkey this year. You’ll be surprised at how much tastier they are! And mysteriously, you won’t be begging to take a nap like we do after eating a non-organic, synthetic hormone-filled turkey. 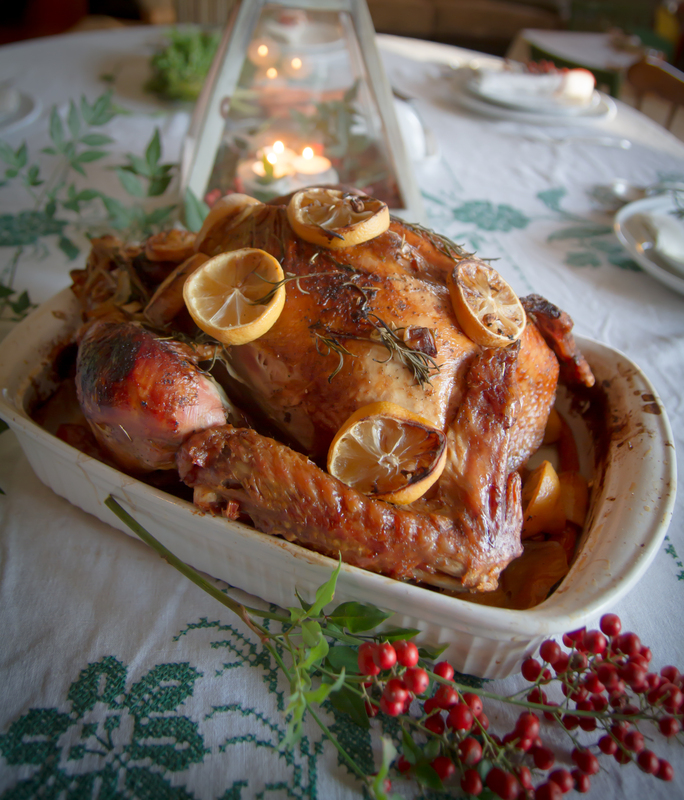 Check out my turkey recipe to make sure you prepare your turkey the paleo way. I love mashed potatoes, but potatoes just don’t fit into my plan for a healthy body. Amazingly, there’s a great replacement. Cauliflower! It’s a vegetable that many high-end restaurants use as a luxurious mash underneath a savory piece of steak or chicken. And you can enjoy them this Thanksgiving and still keep your body on track with health. 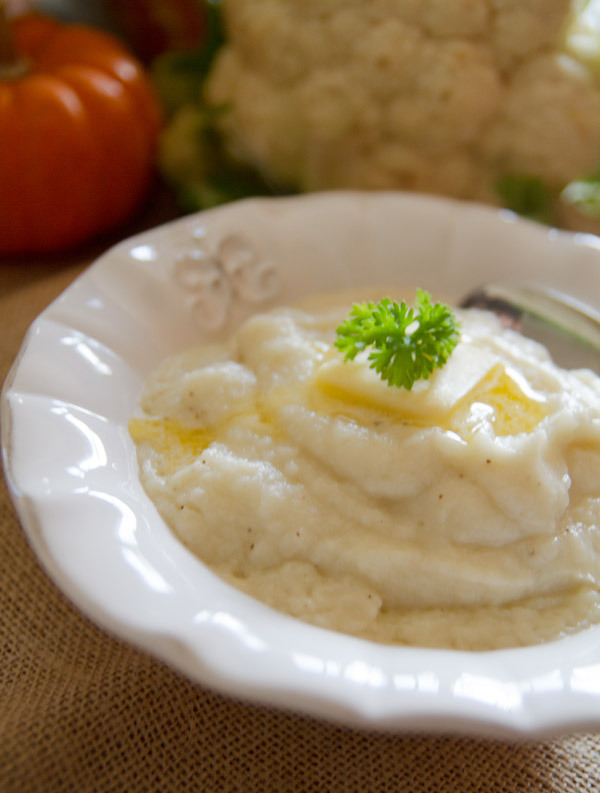 This Cauliflower Mash is rich and tasty. I know you’re going to love it, as do I and my family, including two finicky little boys! Click here for the recipe. I absolutely love green bean casserole, but all the canned mushroom soup poses a problem for my sensitive body. Joshua Weissman of Slim Palate offers an ingenious solution using an incredible cashew cream puree in place of the soup, which totally satisfies. It’s amazing at how similar the taste is! He uses crispy shallots instead of the store-bought fried onions we’re all so accustomed to eating. Oh my goodness! Addicting!! Seriously, these shallots are like bacon. It’s really hard to not eat them all before putting them in the casserole. 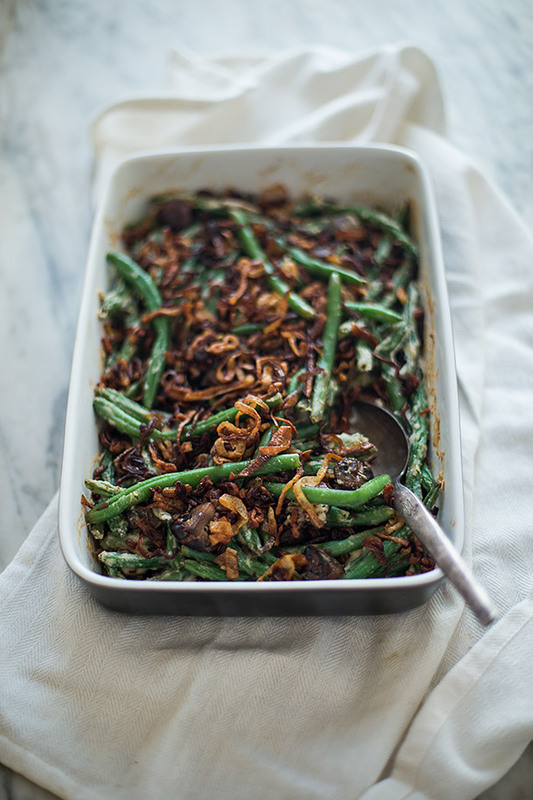 Be forewarned, it’s worth saving some for the casserole! Just make extra. When I make this recipe, I alter just a couple of the steps during the preparation. I mix the mushrooms and the cashew cream before adding them to the beans because it reminds me of the mushroom cream soup and I saute the green beans with garlic instead of steaming them. I find with those two modifications it creates more flavor throughout. See Joshua’s beautiful recipe here. Thanksgiving would not be complete without the stuffing! Actually, in my opinion, I don’t think it would be complete without any of these dishes. However, some people eat pizza for Thanksgiving, so maybe it’s just about being thankful. Or maybe those people are just really thankful for pizza. Anyhoo, It definitely doesn’t hurt to have your taste buds tantalized the paleo way while being thankful, right? 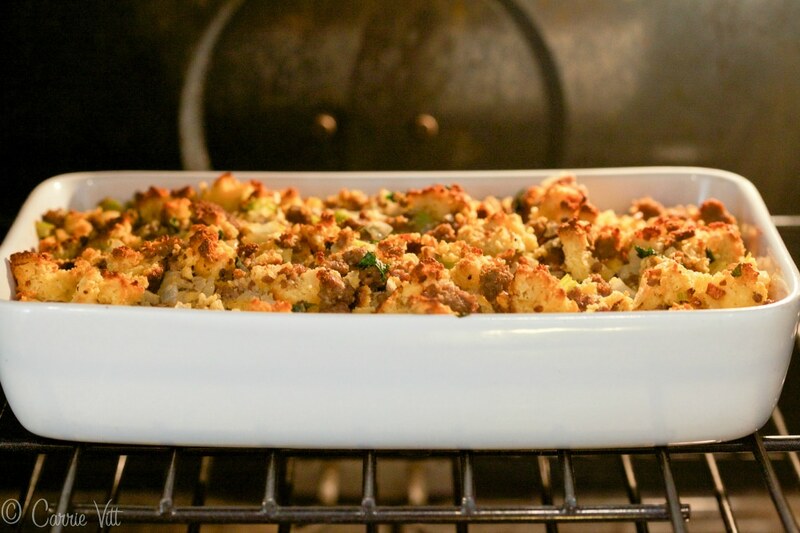 This stuffing recipe from Carrie Vitt of Deliciously Organic is luxurious and great with or without the sausage. I adore it! And it really helps to have the bread-like “cornbread” to fill your belly. Which by the way, I think tastes better than any of the non-paleo foods on the table. You need to prepare the “cornbread” the night before for it to be ready to put into the stuffing on Thanksgiving Day. Carrie mentions this in her recipe, but somehow the first time I made this it slipped past me. Just looking out for you lovelies! Check out Carrie’s recipe here. 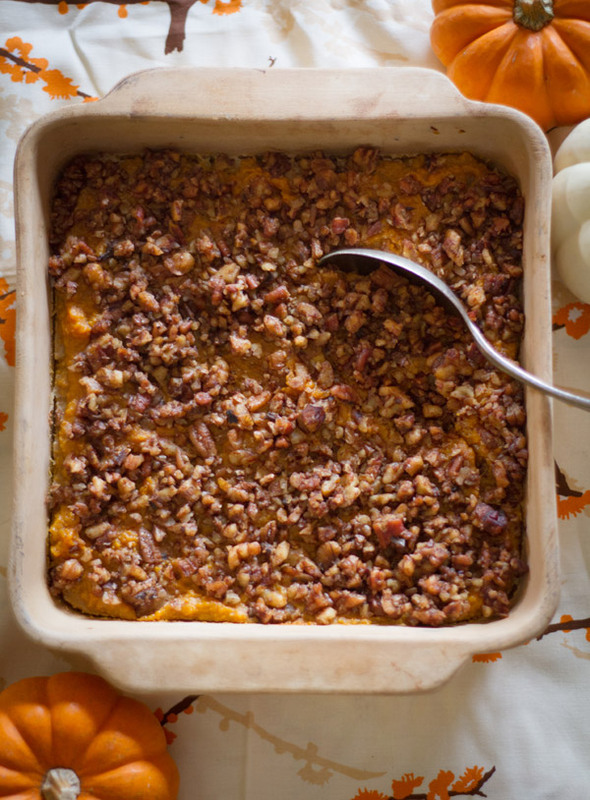 Sweet Potato Casserole has always been my favorite of all the Thanksgiving dishes. This butternut squash casserole is so incredible, you can hardly tell the difference! The first year I made this, I hadn’t baked much with nutmeg. After baking for two straight days, I finished mixing the squash base for the casserole. When I tasted it, to my horrific surprise, it had a very strong taste of soap! I thought surely something had gone very wrong. Heart broken, I reluctantly threw it out. I had no idea at the time that, to some, nutmeg tastes like soap. Who would’ve known? I made another batch, used a little less nutmeg this time and had a pretty good casserole. Although, now I leave the nutmeg out all together and I think it’s perfection on a plate. Love it! I hope you enjoy it as much as I have. Click here for my recipe. 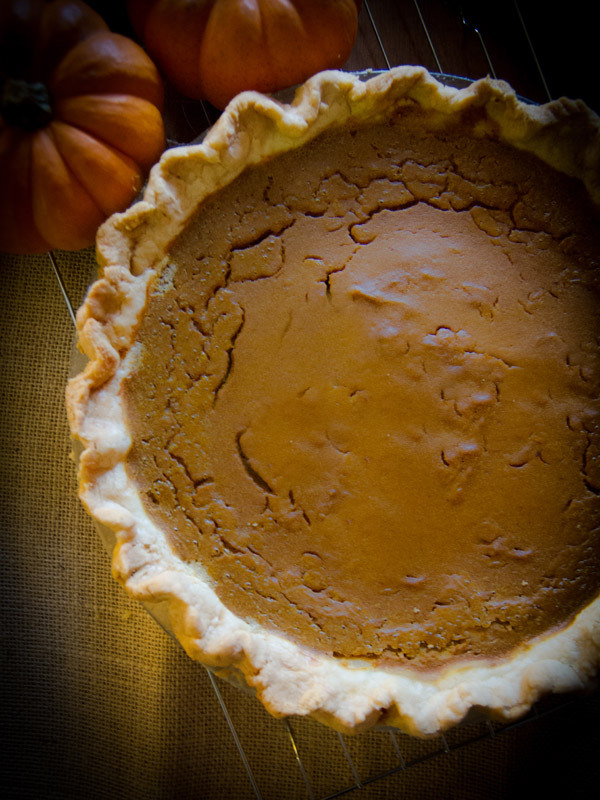 We can’t have Thanksgiving without pumpkin pie! In previous years I’ve tried several different crusts and they’ve been okay, but they’ve still fallen a little short of the flaky crust that I used to absolutely love. So, this year, I’ve decided to venture into unknown territory and create my own pie crust. It’s proven to be a little more difficult than I suspected. Paleo pie crust is a delicate matter, but I think I’ve come up with a good one! I hope you enjoy this Paleo Pumpkin Pie!